RIDGE Mountain Academy - Why RIDGE? 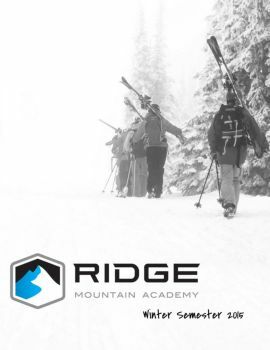 Ridge Mountain Academy is designed for student athletes ages 16-22 seeking a challenging and formative experience for their off-campus semester. Learn more about what makes our program unique. Whatever your background or starting level, the RIDGE program is designed to arm you with the knowledge and experience you need to travel safely in the mountains and enjoy the best mountain sports on the planet. At RIDGE Mountain Academy hands on, active learning happens every day and is integrated into your daily schedule. Not only will you learn how to train and compete on the mountain, you’ll learn how to balance school and work with the physical challenges you enjoy. RIDGE Mountain Academy is located in Whitefish, Montana deep in the Rocky Mountains. Minutes away from Glacier National Park and Whitefish Mountain Resort, it’s a small mountain town that’s big on personality, community, and ... mountain sports.